Delsey Helium Shadow 2.0 Review - Is it Durable? 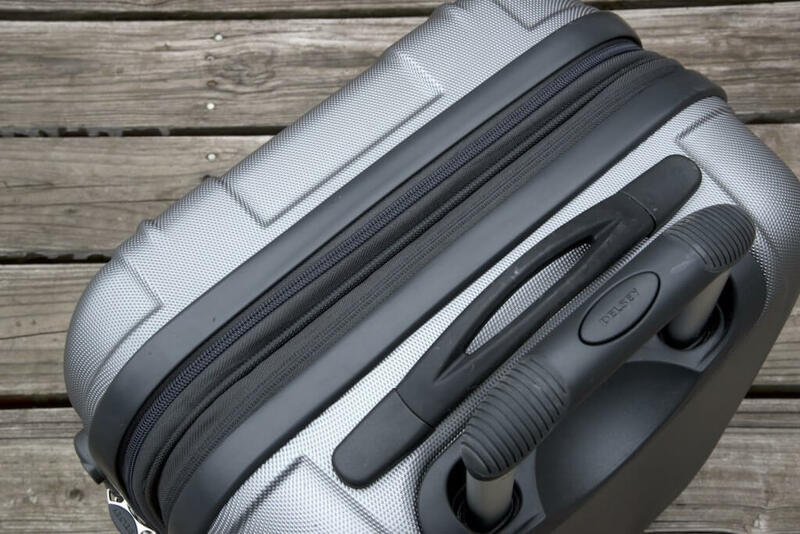 I’m reviewing the 21 inch carry on Delsey Helium Shadow 2.0 in the color platinum. The Helium Shadow also comes in 25 inch and 29 inch versions. This hardshell is somewhere between the rugged utilitarian Samsonite F’Lite and the elegant business minded Samsonite B’Lite. The Delsey Helium Shadow 2.0 is a carry on hardshell suitcase available in purple, platinum (the one I’m reviewing) or blue. The luggage has a normal design and layout with everything where you’d expect in a modern hardshell suitcase. While it may have a run-of-the-mill look, the Delsey Helium Shadow 2.0 stands out in terms of it’s features, weight and durability. This all rounder should meet the needs of any traveler. This suitcase has gone around the world, taken aboard and checked in. My mom checked it in when she flew to Korea, and it was stored in the overhead compartment when flying to Quito, Ecuador. With that said, the durability of the Delsey Helium Shadow is pretty impressive since there aren’t any dents or major scratches. Due to the textured exterior, the Helium Shadow doesn’t scratch easily, unlike the Samsonite F’Lite. When flying back from Ecuador, we had 4 ceramic mugs packed in the suitcase. Even though we checked the suitcase in, the cups survived and am sure the hardshell exterior of the Delsey helped. At 7.6 pounds (about 3.5 kg), the Helium Shadow has an average weight when compared to other carry on suitcases. As a comparison, the Samsonite F’Lite (not carry on sized) weighs 11.3 pounds and the B’Lite (carry on sized) weighs 5.8 pounds. Measuring 21in X 14in X 10/11.8in (10 or 11.8 inches wide depending if you are using the expansion), the Delsey Helium Shadow 2.0 meets standard carry on requirements. The four spinner wheels make moving through the airport easy and allow you to slide around tight spaces with little effort. The handles of the Delsey are smooth as well, retracting and protracting without any blips. The expansion is a useful feature allowing you pack more just in case you end up coming home with lots of souvenirs from your travels. Also, you won’t need to buy a lock for the Helium Shadow since there is a built-in TSA approved combination lock located at the side of the suitcase. You can easily reset the default numbers and make up your own combination (instructions for that are in the instruction manual). 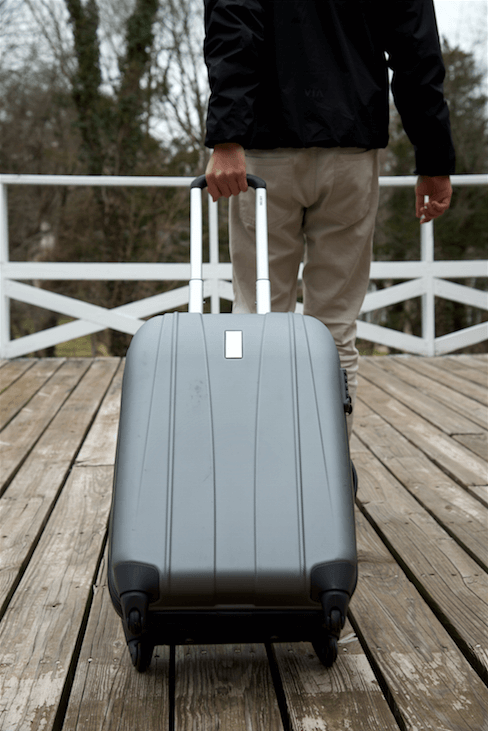 While the original price of this suitcase is $320.00, you can find it on sale for around $100 on both Amazon.com and eBags.com. According to eBags.com the suitcase has a 10 years international warranty. While testing it, I haven’t had any real issues with the Helium Shadow 2.0. The suitcase has everything you’d need, except that it would be nice if there was an exterior pocket allowing you to access things quickly without having to open the entire suitcase. The Helium Shadow 3.0 has something like this with it’s front pocket that makes it easy to store and access tickets or a laptop. 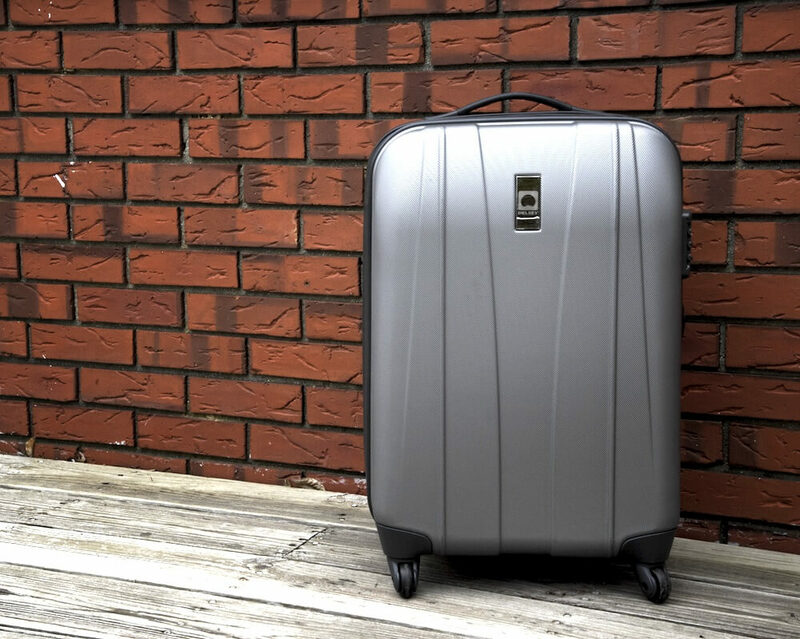 As with most suitcases with small spinner wheels, the Delsey Helium Shadow is better equipped for gliding around an airport, but not cobblestones or rugged areas. The interior of the luggage is pretty basic with a main compartment and a zippered top area. 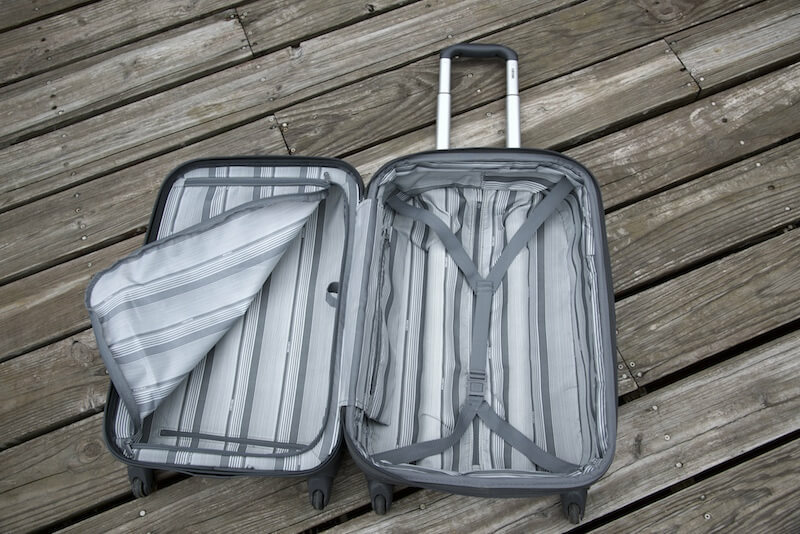 I’d recommend you use packing cubes when traveling with the Delsey Helium Shadow because they would be helpful with organizing your clothes and keeping them from shifting around inside the suitcase. Read more: Are Packing Cubes Worth It? Equipped with smooth spinner wheels, sturdy handles and a sleek exterior, the Delsey Helium Shadow 2.0 is suited for vacationers, business travelers and everyone in between. 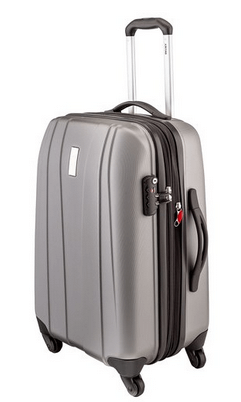 Compare with Samsonite F'Lite Spinner. Be sure to also check out our reviews of the Samsonite F’Lite hardshell suitcase and the Samsonite B’Lite. Do you have any questions or comments about the Samsonite B’Lite? Leave your comment below. Thanks for the in-depth review! Will this suitcase be able to fit in the overhead compartment? No problem! Yes, the suitcase will fit in the overhead compartment. It’s carry on sized.